For my Lawton, OK friends who are implementing Saxon Math but don’t have wall space for all of the math meeting components, here are a few links from TPT for grades KG-3rd for ppt / SMARTBOARD versions. The important aspect of the morning meeting is the interactive part where individual students have a role in placing the numbers, days, coins, patterns, clock hands, graph piece, etc. on the board each day. With that said, there is also value in having some of the math meeting components visible throughout the day such as the calendar, 100 chart, and number of the day. Think of the components you or your students would most likely refer to outside of the math meeting time to keep a permanent physical display. Here are the links. Read the other purchasers’ comments and look at the previews to get more info. I have not purchased any of these so I can not vouch for the quality or usefulness. For those of you who already have a math meeting ppt that you recommend, please let us know!! Thanks! This is part 3 of my “Daily Math Meeting” posts. 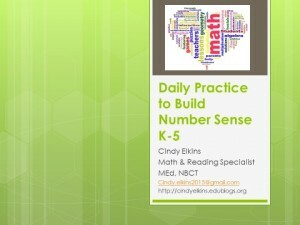 I will share several different fun and motivational math activities that can be done in just a few minutes on a daily basis — all of them building number sense and reviewing concepts of subitizing, number bonds, addition, subtraction, less, greater, even, odd, etc. Monday: “Our number this week is one.” Here’s what it looks like (show the numeral 1).” Students say the number and make it in the air. Teacher shows how to write it. 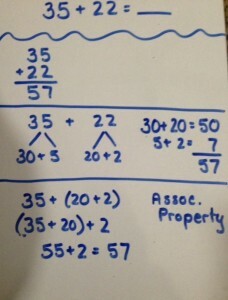 Then show a representation of the number (such as putting something in a jar or posting on the board). For first or second grade: I have two thoughts on this. You could do a number of the day utilizing the calendar date as your number. This means if it’s the 14th of the month, you are focusing on #14. This also means you would repeat these numbers each month – thus giving more exposure to the numbers students are most likely using on a regular basis. 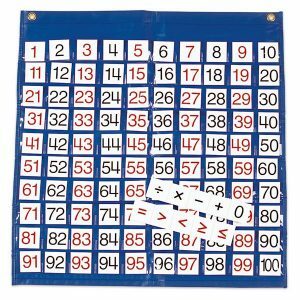 You could add the following concepts to your discussion: place value with tens/ones (in straw bundles, stick bundles, or posting sticky dots on ten frames); expanded notation (14 = 10 + 4); concepts of odd and even, and how to make the number using coins. 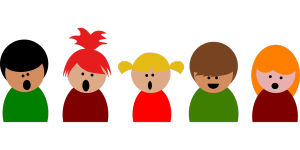 In Part 1, I focused on subitizing practice during your meeting time (for PreK-1st grade classes). This week I will focus on days of the week and graphing opportunities. Rather than posting the whole month at once, post the current date piece each day. Show different ways to write the date (in words, with numbers). Discuss the day before and the day after. Find the day (Monday, Tuesday, etc.). Sing a song or watch a video about the days of the week and months. See list below. 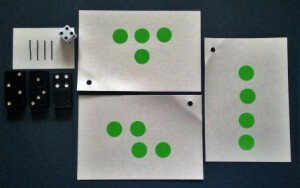 Use the number as a focus for the day: If today is the 5th, let’s look at dot cards with 5, ten frames with 5, dice with 5, count to 5, count backward from 5, tally of 5, spelled form, and number bonds of 5. Consider making patterns with your calendar pieces. For example, September could be red apple, green apple, red apple, green apple . . . for an AB pattern. October could be pumpkin, pumpkin, ghost for an AAB pattern. Or use different colors or shapes (circle, square . . .). Or make patterns based on odd / even numbers, counting by 3’s, 4’s . . . the possibilities are endless. Discuss the pattern, predict what will be next once the pattern is established. Introduce clap patterns which match your chosen calendar pattern. If you are working on AB, then do clap, snap . . . 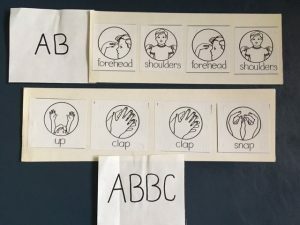 If you are working on ABC patterns, do clap, snap, touch your knees . . . Have children make up patterns to follow. If you have an upcoming activity, predict what the date will be. Example: We are going to the library in 3 days. Today is Monday, so when is our library day? 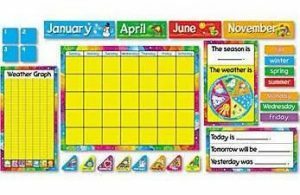 After the calendar is mostly complete for the month, you can emphasize ordinal numbers. Model how to find the first Friday, the second Tuesday, the third Wednesday, etc. Then have students practice. 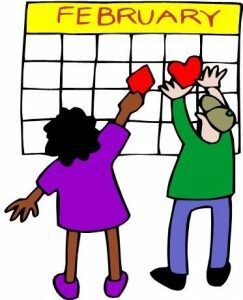 Consider having a student in charge of the calendar each week as one of the class jobs. This student would post the new calendar piece and then get to lead the class in saying the date and other features of the daily calendar. 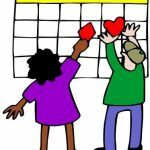 In the next few posts, I will show various ways to conduct daily math meetings which you can incorporate into your daily schedule (as part of your normal morning meeting routine, or at the beginning of your daily math lesson). Daily Math Meetings (10-15 minutes) are vital for quickly reviewing math concepts and number sense in more visual and discussion based format. With primary students, this math meeting might center around the calendar bulletin board (or SMARTboard presentation). 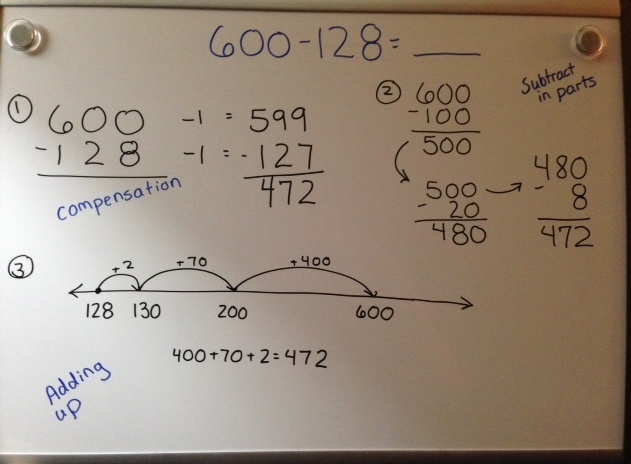 With intermediate students, it begins to take on the aspects of a “Number Talk” with a variety of computational strategies being the focus. The above plus . . . 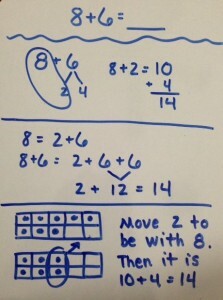 This is the Part 3 of Number Talks. If you are just tuning in, please refer to NT Parts 1 and 2. 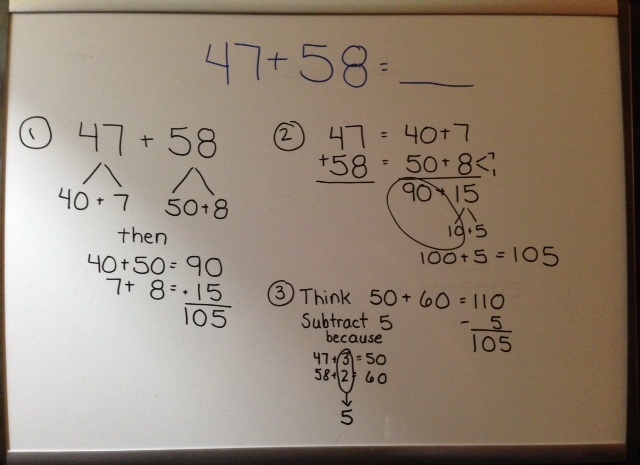 As I mentioned before, conducting a Number Talk session with your students is a chance for them to explain different ways to solve the same problem. This is meant to highlight strategies which have already been taught. Click below to watch 2 videos of how to conduct a Number Talk session with intermediate students. You will see many strategies being used. 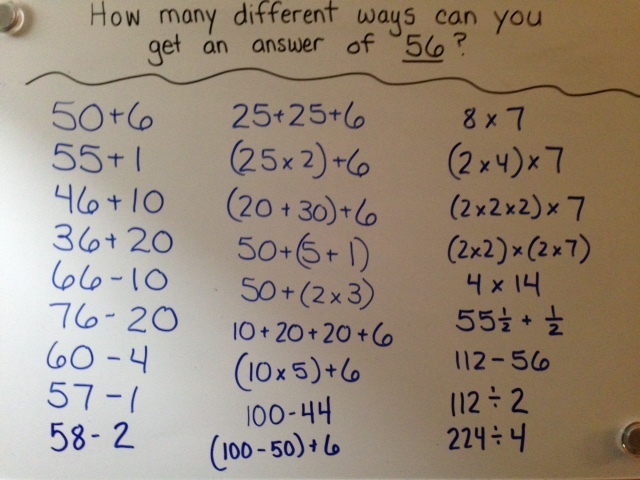 Addition and Subtraction Strategies: I like using the methods listed below before teaching the standard algorithm. This is because they build on a solid knowledge of place value (and number bonds 1-10). If your students are adding and subtracting using the standard algorithm and can’t adequately explain the meaning of the regrouping process in terms of place value, then try one of the following methods. 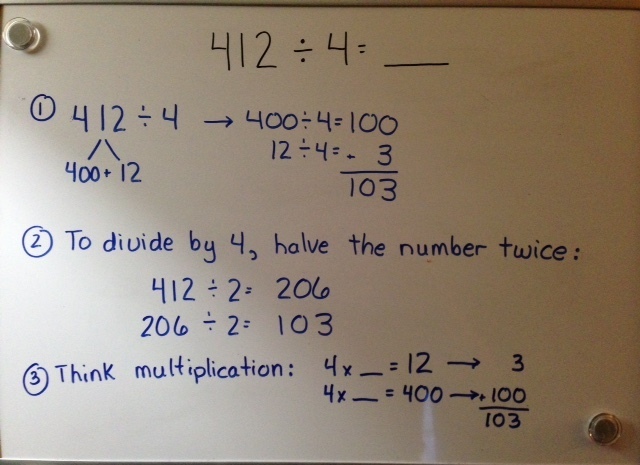 In many cases, I will ask a student the meaning of the “1” that has been “carried” over in double-digit addition. About 85% of the time, the student cannot explain that the “1” represents a group of 10. When adding the tens’ column, they often forget they are adding groups of 10 and not single digits. So they get caught up in the steps and don’t always think about the magnitude of the number (which is part of number sense). You will notice teachers write the problems horizontally in order to elicit the most strategies possible. 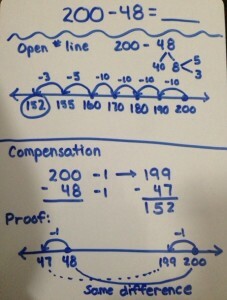 Notice use of place value and number bonds. These methds build strong number sense. I call this “Facts Of.” You can use any number. 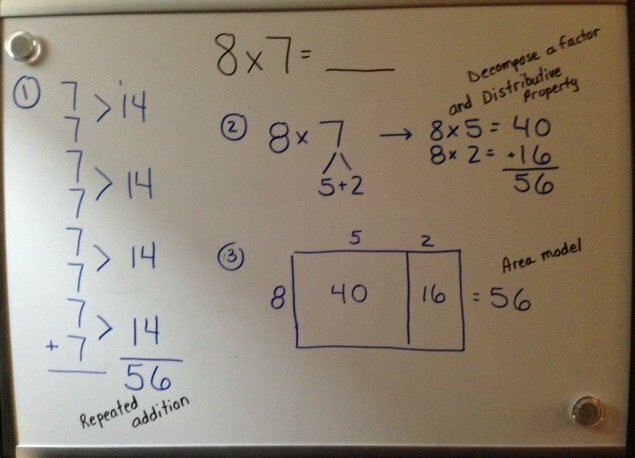 Multiplication and Division Strategies: I like using these methods before teaching the standard algorithms. 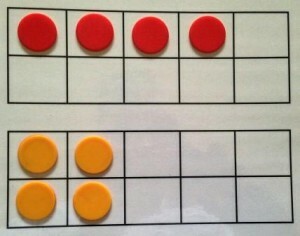 Again, they build a solid understanding of place value, the use of the distributive property, and how knowledge of doubling and halving increases the ability to compute problems mentally. Once these methods have been learned, then it is easy to explain the steps in the standard algorithm. Use the known (6 x 2) to learn the unknown problem. To divide by 4, halve the number twice. To divide by 8, halve the number 3 times. 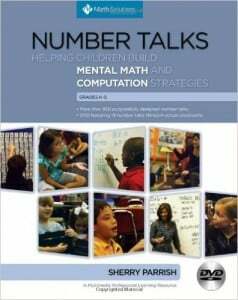 For 1st -3rd grade students: Refer to “Number Talks Part I” (posted Nov. 12, 2016) for ways to conduct a Number Talk with KG and early 1st grade students (focusing on subitizing and number bonds). 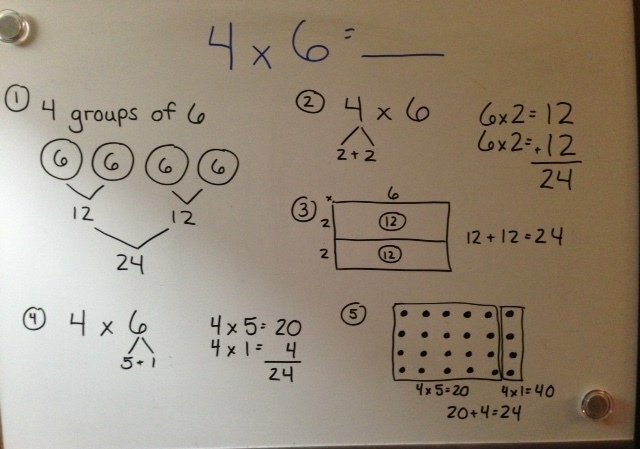 For students in 1st – 3rd grade, place extra emphasis on number bonds of 10. Write a problem on the board, easel, or chart tablet with students sitting nearby to allow for focused discussion. Have the following available for reference and support: ten frame, part-part-whole template, base ten manipulatives, and a 0-100 chart. 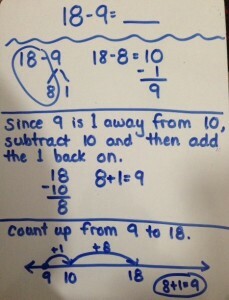 Present addition and subtraction problems to assist with recall of the following strategies. 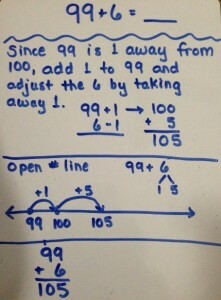 If time allows, post another similar problem so students can relate previous strategy to new problem. Students show thumbs up when they have an answer in mind. The teacher checks with a few on their answer. Then he/she asks, “How did you solve this problem?” The teacher writes how each student solved the problem. 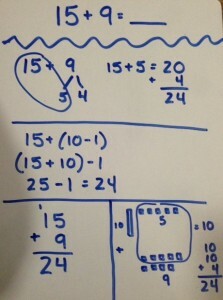 A Number Talk is an opportunity to review number sense and operations by making it part of your daily math routine — so that what has previously been taught is not easily forgotten.